Our friends from Kinja Deals are taking over Income Disposal. Commerce Content is independent of Editorial and Advertising, and if you buy something through our posts, The A.V. Club and Gizmodo Media Group may get a small share of the sale. Click here to learn more, and don’t forget to sign up for our email newsletter. We want your feedback. Whatever your computing needs might be, Amazon’s running a grab bag of a Gold Box deal full of deeply discounted networking and storage products, today only. Inside, you’ll find a a selection of wireless routers (including a Luma mesh router), several range extenders and powerline adapters, a couple of modems, a NAS, a 120GB SSD for $35, and more. There’s not much rhyme or reason to the sale, except that all of the products are united by great low prices. Just remember that like all Gold Box deals, these prices are only available today, or until sold out. Today only, Amazon will ship you all seven Alien franchise movies on Blu-ray for $35, which is $5 a piece, or $5.83 if you don’t plan on watching Prometheus. 10 Cloverfield Lane is an uplifting story where three strangers find an oasis away from all of the world’s problems, and you can rent it in HD for just $1, courtesy of iTunes and Amazon. After you order the rental, you’ll have 30 days to start watching, so there’s no need to rearrange your plans tonight. Harman Kardon’s SoHo on-ear headphones were a pretty solid buy in 2013 when they debuted for $200. But for $40, they’re an absolute steal. A few different colors are available today, just be sure to get the one with the correct remote for your phone OS of choice. 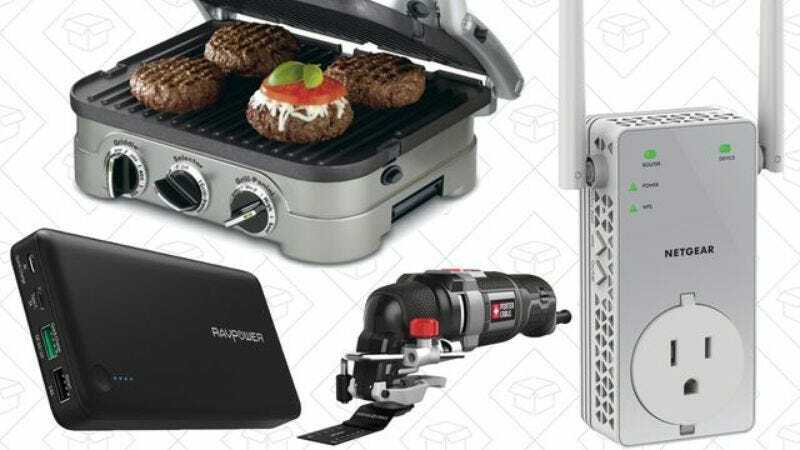 Cuisinart’s 3-in-1 Griddler is one of the most versatile kitchen appliances you can own, and it can be yours today for just $64, the best price we’ve ever seen outside of a one-day Gold Box deal. If you aren’t familiar with this amazing little gadget, it’s a surprisingly large indoor grill, a griddle, and a panini press, all rolled into one. I’ve owned it for over a year, and I use it on a weekly basis. An oscillating multi-tool is one of those things you might not use on a weekly basis, but it’s useful enough that everyone should have one in their tool kit. This Porter-Cable kit comes with 52 accessories to get you started, including sandpaper pads, scrapers, and wood and metal-cutting blades, and its 3A motor can spin anywhere from 10,000 to 22,000 RPM, making it perfect for a variety of jobs. Today’s $80 deal is the best Amazon’s listed all year, and roughly 50 percent off its usual price. Just remember that it’s only available today, or until sold out. Mpow’s Magneto Bluetooth earbuds look a lot nicer than the uber-popular Swifts, and at $16, they’re not any more expensive. They even pause your music automatically when you snap the two magnetic earbuds together. It’s almost already holiday decorating season, and these great-looking crystal ball solar string light strands will only set you back $10 each today, in three different colors. And with a built-in solar panel, you won’t even have to worry about plugging them in. If you missed out on on last month’s Bosch Insight wiper blade sale, or if you just don’t like Bosch Insight blades, Amazon will sell you two Michelin Stealth blades today for $20. Just add any two to your cart (shipped and sold by Amazon.com), and the price will automatically be reduced to $20 at checkout. The deal even works if you buy two different sized blades, so you should have no trouble finding a combination that fits your car. Titanfall 2 just came out like, two weeks ago, but it’s already 50% off at Amazon. Grab a copy for Xbox One or PS4 for only $30. RAVPower’s new battery pack is built for the future, with a Quick Charge 3.0 input port (which can recharge the entire battery pack in under 5 hours), a QC 3.0 output port, and a separate USB-C port that operate as either one. It’s a little pricey at $60, but today on Amazon, you can bundle it with a dual Quick Charge 3.0 wall charger for free. Just add both to your cart, and use code ZG5ASIT8.